Don DeBlieux prepares mammoth fossil tusk segment for removal and transport. Elaine and Earl Gowin look on while Utah Geological Survey (UGS) paleontologist Don DeBlieux and his wife Jane apply a plaster jacket to a mammoth tusk to protect it during transport to the UGS. The mammoth tusk was discovered on November 13, 2004 by a bulldozer operator working in a sand and gravel quarry on the Gowins’ farm near Fillmore, Utah. The Gowins called the Territorial State House Museum in Filmore about their discovery, which directed them to contact Jim Kirkland, Utah State Paleontologist, at the UGS. Work has begun here at UGS to stabilize the tusk and prepare it for study and display. Gravel quarries in Utah are common gravesites for Ice Age animals. This new find is one of the first recorded localities of a mammoth along the southern margins of ancient Lake Bonneville and will add to our understanding of life in Utah during the Ice Age when herds of mammoths, large-horn bison, and camels roamed the land, climate was colder and wetter, snow and ice accumulated in the mountainous regions, and Lake Bonneville was rising to its maximum level. It’s hard to say whether the unearthed fossil is that of the mammoth or that of the mastodon. These mammals ranged from Alaska and the Yukon, across the mid-western United States, to Mexico and Central America. The mastodon was shorter and stockier than the mammoth, which stood almost 14 feet at the shoulder (4.2 m), and weighed 8-10 tons (8,000 kg). 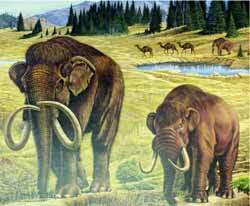 The mammoth may have eaten as much as 700 pounds (300 kg) of vegetation a day! 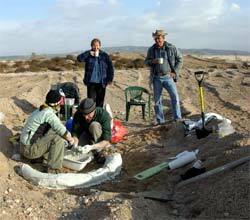 Fossil finds provide a significant amount of information to science. If you find a fossil, please contact Jim Kirkland, Utah State Paleontologist, @ 801. 537.3307, fax: 801.537.3400, or email: jameskirkland@utah.gov.